Historian Dr. Doug Sobey’s research has discovered a 1752 census of PEI that shows seven Acadian families, bearing the names Daigre and Landry, lived and farmed on the shores of the North River on the Upton Farmland property. According to Dr. Sobey, the Acadian settlement was located near what is now the causeway at Poplar Island. In addition, his research reveals that Dutch explorer and surveyor Samuel Holland (1728 – 1801) was instructed in 1764 by his superiors at the Board of Trade in London to begin a survey of all the British possessions north of the Potomac. He arrived on Prince Edward Island (then known as St. John’s Island) in early October 1764 and spent the next twelve months based at Observation Cove near Port La-Joie overseeing the work of four survey parties mapping the various parts of the island’s coastline. His knowledge of the forest over much of the island was based on what he and the others could examine from the coasts and rivers – he wrote: “all rivers and creeks were surveyed as far as boat or canoe would go, or the chainmen penetrate, but sometimes we were obliged to stop, by inaccessible woods and swamps”. Dr. Sobey has superimposed Samuel Holland’s 1764 survey map on a modern-day map of PEI. It clearly shows the Acadian settlement located on the Upton Farmlands. This map will be posted on site shortly. According to Parks Canada, the first Europeans to settle Prince Edward Island came from France in 1720 and were quickly joined by a small group of Acadians from Nova Scotia. They were warmly received by the Mi’kmaq, who helped them considerably. 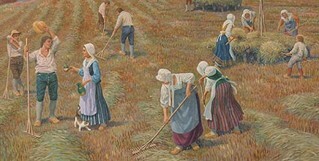 The Acadians endured great hardships including crop failure, infestations of mice and the ongoing conflict between the French and British in North America. The British deported all but a small group of approximately 300 Acadians from the island in 1758. The Acadians who remained and those who returned to the island in later years established numerous fishing and farming communities along the coast during the 18th and 19th centuries. Picture courtesy of Parks Canada. This entry was posted on October 15, 2007 at 11:54 am and is filed under History. You can follow any responses to this entry through the RSS 2.0 feed. You can leave a response, or trackback from your own site.